The process of finding a file with HoudahSpot mirrors how searches start for most people. Usually, that begins with a recollection of something about a file; whether that’s a bit of text from the file name, the contents of the file, or something else. In that case, you do just as you would in your browser. Type the text you are looking for into HoudahSpot’s search field and hit the Return key or click the play button next to the search field. That kicks off a search that remains active until you click the stop button. HoudahSpot’s search field also supports several advanced search operators like predefined relative dates such as ‘next week’ and ‘yesterday’ as well as wildcard characters, boolean operators, numeric values, comparisons, ranges, and more. Additional searches can be started in a separate window or new tab. If you find what you were looking for immediately, you probably didn’t need HoudahSpot to find it. The app is most useful when your first rudimentary search turns up hundreds or thousands of files in HoudahSpot’s results pane, which is when its search parameters come into play. Below HoudahSpot’s toolbar, up to four panels can be displayed. The far left panel is where templates, snippets, and favorite tags live, which I’ll cover later in this review. The next panel of HoudahSpot’s window is where searches are refined. There are more options for refining a search than make sense to list in this review. In total, there are around 200 different parameters you can use to refine a search from common ones like ‘File Extension’ to obscure ones like ‘dSYM UUIDs.’ HoudahSpot doesn’t overwhelm users with every choice though. Name, Kind, Tags, Last Opened, Created, Modified, File Extension, Text Content, and others are all available from a drop-down menu in the Refine pane. The rest are available by choosing ‘Other’ and browsing the full list of filter parameters. Refining a search with HoudahSpot's hundreds of search parameters. For each search parameter you pick, the search can be further refined with qualifiers that depend on the kind of parameter you are searching. For example, a Text Content parameter can be limited to ‘contains prefixes,’ ‘contains words,’ ‘contains phrase,’ and ‘contains all.’ Search parameters can also be grouped, allowing you to pick a series of parameters and require that ‘All,’ ‘Any,’ or ‘None’ of them be true. As you build a search, rows can be disabled temporarily to test alternative setups without deleting them, which is a great way to experiment with how a new row affects search results. Right-clicking a row provides several options to nest or duplicate lines, add snippets, save lines as snippets, and more. The flexibility is impressive and allows for rapid iteration of search formulations. Searches can be refined by location too. You can choose any drive or volume on your Mac as well as user-mounted remote volumes or exclude locations, which is a fantastic option when you want to search a top-level folder, but for example, you know the results from a large subfolder can be safely excluded. HoudahSpot also allows you to set minimum and maximum limits on the number of results returned based on how recently the files were created, opened, or modified. Once you begin searching for files, your search results remain live, updating as you add filters automatically, until you click the stop button. This allows for an iterative process with immediate feedback. Instead of running variants of a search over and over, your search benefits from a tight, frictionless feedback loop in the results pane, reducing frustration when you don’t find what you're looking for at first. HoudahSpot assumes that most searches are transient and not something you want to save, so it doesn’t do so automatically. 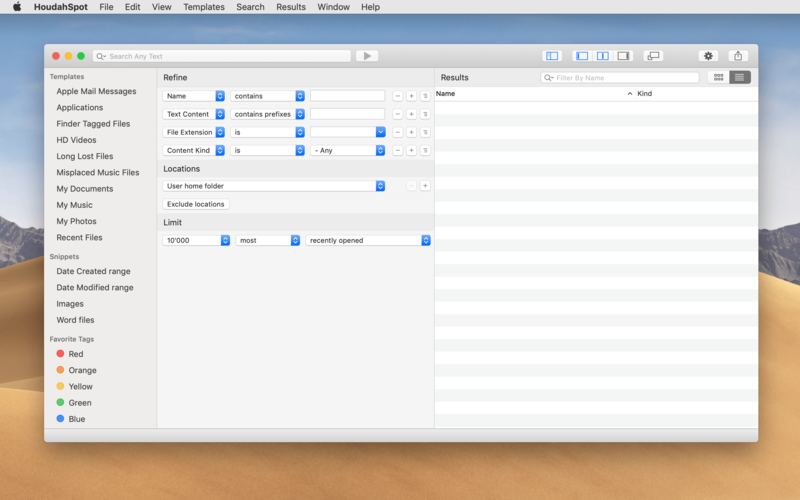 However, searches can be saved as separate HoudahSpot documents that open in the app and execute the saved search. That strikes me as the right approach. Most often, I’m merely looking for a particular file that I’ve lost track of on my Mac and don't need to repeat the search later. That’s not to say, however, that you have to start from scratch with every search you conduct in HoudahSpot. Besides saving searches, you can create Templates and Snippets. Templates are similar to saved searches that serve as re-usable recipes for finding a particular category of files. The Misplaced Music Files Template. HoudahSpot comes with several built-in Templates that help illustrate the concept. 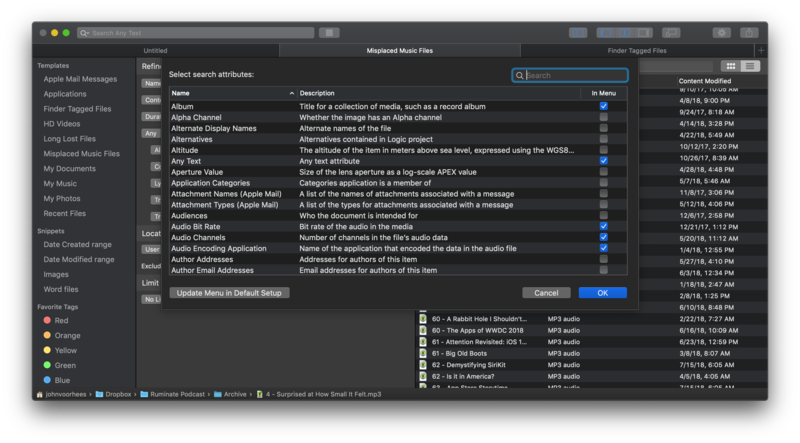 For example, ‘Misplaced Music Files’ looks for audio files with certain metadata characteristics that are outside your Mac’s Music folder. There’s another template that finds files that have been tagged using the Finder’s tagging system. You can use these templates and ones you save yourself as complete searches that you run over and over or as starting points that you can modify. Snippets are a little different. A snippet is a self-contained series of steps that are useful in a variety of different searches. For instance, the ‘Date Created range’ snippet consists of a ‘Content Created after’ and a ‘Content Created before’ parameter, both of which must be true. Instead of reimplementing these rules over and over every time you need a date range, you can add the snippet to the search you’re building, saving some time. A 'Date Created range' Snippet. The left-hand panel also houses your favorite file tags. If tagging’s your thing, dragging a favorite tag into the Refine panel is a quick way to narrow your results. HoudahSpot’s utility isn’t limited to how you set up searches. The results panel includes additional functionality for finding what you need. Results can be displayed as a list or grid. There’s also a fourth panel on the far right that can be opened to preview a file’s contents and metadata. When previewing the contents of a text file HoudahSpot zeroes in on the parts that contain your search terms, making it easy to quickly identify if you’ve found what you’re looking for. To see more, there’s an ‘Unfold’ command in the View menu, which displays the file’s full contents. HoudahSpot displays extensive metadata about files. Results can be arranged by app, date added, created, last used, and modified, file size, and total size. In Grid view, you can turn on additional file information which will display information like an image’s size, f-stop, shutter speed, ISO, and other metadata directly below the file name. The info panel on the right side of the window can also be moved, so it appears beneath the list of results to conserve horizontal space. The files displayed in the results pane can be filtered in several ways too. Using the search field at the top of the results, you can filter or exclude files based on their name, path, file name, folder name, and folder name in path. The filters you apply can be as simple as a string of text or as complex as a regular expression. HoudahSpot’s view options and filters are an essential final step in finding a file, especially if after refining your search, you still have a large number of files to sift through. There are lots of other features big and small that make HoudahSpot a premier power user tool. One of my favorites is compact mode. With the click of a button in the app’s toolbar, HoudahSpot’s window and chrome shrink down to a compact size. Once you’ve found the files for which you’re looking, compact mode is a fantastic way to help arrange your windows that makes dragging files into another app or folder easier. HoudahSpot also includes a Finder extension that sits in the Finder’s toolbar and a Quick Action available in the Finder’s sidebar. It’s a little thing, but if you’re working in the Finder and can’t find the right files, the ability to quickly open HoudahSpot with its extension to access its more powerful tools is helpful. I wish, however, that HoudahSpot could grab any search you’ve started in the Finder and make that the starting point of your HoudahSpot search, but it doesn’t do that. However, HoudahSpot will open a new search window restricted to the folder being viewed when the extension or Quick Action is clicked. HoudahSpot supports Mojave’s Dark Mode as well as the Touch Bar, from which you can do things like start and stop a search, preview files, sort and tag results, and share files. Keyboard shortcuts are available for tagging and summoning HoudahSpot’s templates. If you enable the HoudahSpot menu bar app, you can also set keyboard shortcuts to open the app, open the search bar that also appears when you click on the menu bar app, and to search the currently-active Finder window. Automation is available throughout HoudahSpot too. There are Alfred and LaunchBar actions to trigger searches from those apps. There’s also a PopClip extension that can be used to start a HoudahSpot search for any text you highlight. There are macOS Services for starting searches, AppleScript support for starting new searches and conducting searches based on the active Finder window, and a URL scheme for integrating HoudahSpot searches in other apps that support them. There is a lot of power and complexity right under the surface of HoudahSpot’s simple interface, but what I appreciate most about the app is that, although its power-user tools are always close at hand, the app works just as well with a simple search. That has the benefit of making it easy to start with what seems like a simple search then bring HoudahSpot’s more advanced tools to bear when your search turns out to be something more demanding. Its scalability means you don’t need to reserve HoudahSpot for those times when you know you’ve got a tough file to find. Instead, the app can be used as a complete replacement for searching for files via Spotlight or the Finder’s search field. I've been using HoudahSpot 5 for a few months now, and it has steadily taken over more and more of my file search needs. 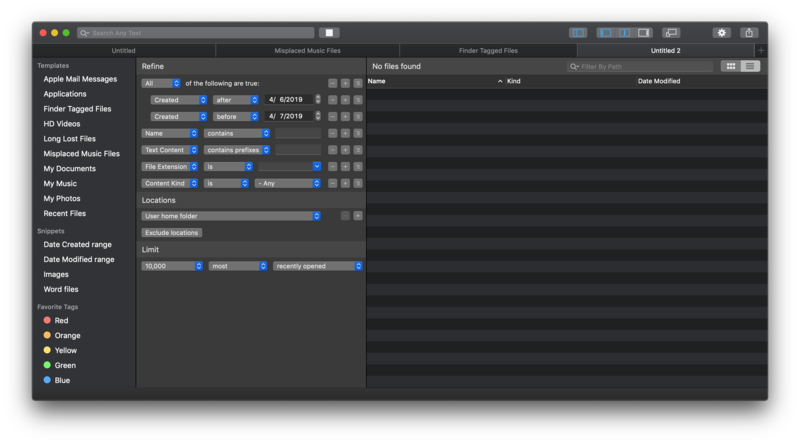 I still go straight to the Finder to access well-organized, favorite folders that I keep in the sidebar, but for everything else, I usually start with a custom Alfred search workflow that you can download here. 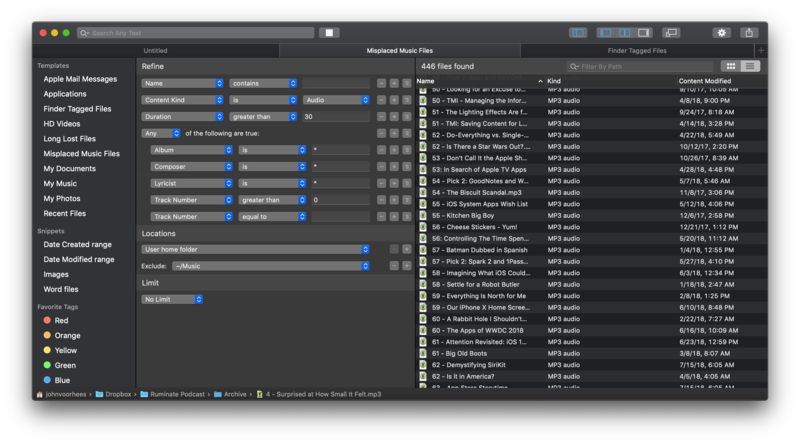 Once you learn some of HoudahSpot's search syntax, Alfred searches such as kind:mp3 author:turner, which returns every MP3 on my Mac by Frank Turner, are incredibly useful. 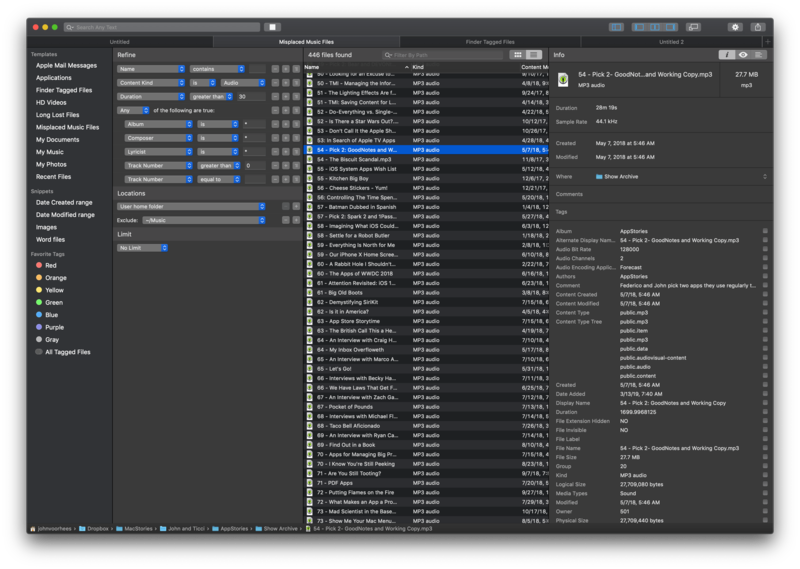 Spotlight would return the same MP3s using my example search, but only the five most recently-opened files. In contrast, if my search returns a lot of results, my Alfred workflow has already opened HoudahSpot, so I can immediately access its tools to refine my search and filter results. 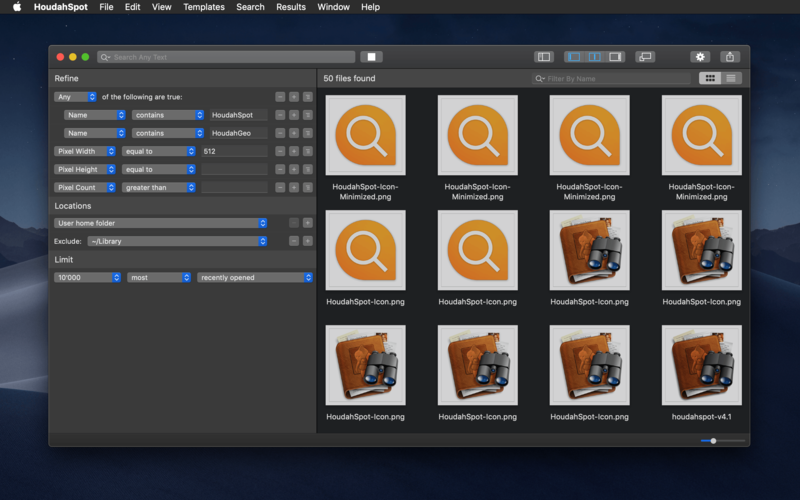 I've found that the years-old habit of searching from inside the Finder is hard to break, but if you find yourself frustrated when you formulate more complex searches, I highly recommend giving HoudahSpot a try. The time I've invested in learning the app and retraining myself have been well worth the effort. HoudahSpot is available directly from Houdah Software for $34 for a single license and $52 for a family license that includes everyone living in the same household. The app also offers a free trial.